Tania James’s bold novel processes the complicated landscape of elephant poaching and conservation in southern India. Shifting among the perspectives of an American aspiring filmmaker, a poacher’s younger brother, and an elephant, The Tusk That Did the Damage examines the ivory and documentary film-making trades and those involved with them. Herself a former filmmaker and Fulbright recipient to India, James captures the complicated social position of two American graduates trying to create the documentary that will make their names. The elephant whose name is “a sound only his kin could make in the hollows of their throats” carries what would otherwise be a thoughtful, but conventional narrative of a well-meaning, but not particularly well-doing American twenty-something and a hopeful, but doomed teenaged farmer. The novel begins with the Elephant’s roaming memories of duckweed, “the tang of river water,” a path pounded out by generations, and the touch of a mother’s trunk. Even the paragraphs are separated by spaces that visualize the giant spaces between steps and the thoughts unrepresentable by human words. The Elephant’s perspective is the most successful aspect of the novel, and as such it is the place that could have most benefited from going further. Although the human narrators’ voices are written in the first person, the Elephant’s perceptions are written in the third. At first, this seems to acknowledge the unknowable wildness of an elephant’s thoughts. And, yet, James shies away from leaving this compelling perspective to develop into its potential fullness. Memories of the Elephant’s herd and his mother’s death resurface painfully throughout the novel, but after the Elephant’s capture, the narrative slips towards the perspective of his stick-wielding pappans. Although this shift could be read as a representation of the Elephant’s increased insanity and entrapment, it also writes him back out of the novel and thus diminishes the overall complexity of the experiences presented by the book. Both within the thoughts of its narrators and as an overall project, The Tusk That Did the Damage considers the psychology of minds other than our own, human and non-human. Looking at a zoomed-in shot of an elephant’s eye, Emma ponders, “I found the eye haunting for reasons unclear: Because I saw something familiar inside, a consciousness I could recognize? Or because I couldn’t?” At once naïve, egotistical, and curious, Emma both wonders whether birds can suffer from “Wing Boredom or Flock Joy or Plummet Buzz, things we couldn’t feel and, therefore, could never understand” and manages not to wonder enough about her relationship with her human interviewees. Of one, she thinks, “even in the space of a few hours, I thought I’d come to know him,” only later to worry about whether she had “cast him as the sweet, clumsy native before he’d even opened his mouth.” Over the course of interviewing subjects for her film, Emma realizes how her privilege enables her to come and go, to demand answers, and to accuse. The filmmakers never meet the poachers; they never witness the danger of the forest rangers who protect the national park. 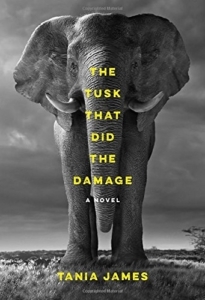 The novel condemns the ivory trade and the damage it does to elephant and human families, but it does not condemn all those who participate in the trade. Rather, it helps the reader to acknowledge the colonial and neocolonial forces that have manipulated the ability of local farmers to succeed at their trade for hundreds of years and who continue to drive up the global prices of luxury goods. The randomness and excess of the trade’s violence and the understandable fear it arouses pervades the novel. Only the American filmmakers are oblivious to this risk; Emma’s companion shows more fear of food poisoning than of a protective, potentially deadly elephant mother. The third narrator, a teenage Indian farmer named Manu, tells his story as if the reader were huddled next to him around a fire. Others “may know the tune” of the story he’ll tell, but “I would bet a half bag of pepper the words are all wrong,” he boasts. Manu introduces his community as one that is particularly invisible to outside eyes, “neither poor enough nor princely enough to appear on Western screens.” When he first hears of the filmmakers, he wonders, “What did the BBC want with us?” Nothing — they have eyes only for elephants. James succeeds at using storytelling rather than spectacle to draw readers into her novel. The Tusk That Did the Damage reads engagingly, addressing grim events while not aestheticizing the violence of the poaching trade. For me, the novel went by all too quickly. Without didacticism, James repeatedly reminds readers to admit complexity. Her well-researched text inspires curiosity, concern, and caution of proclaiming judgment. Even as I am newly drawn to watch documentaries about elephants and poaching because of the novel, I am also reminded of the ways these documentaries often tell the pre-determined stories of those only coming for a safely chauffeured, subtly-scripted visit. The Tusk That Did the Damage sets itself apart from hero-villain poaching stories, offering an important variety of perspectives to this difficult subject. Emma Schneider is a graduate student at Tufts University. Her research focuses on North American and Environmental Literature.